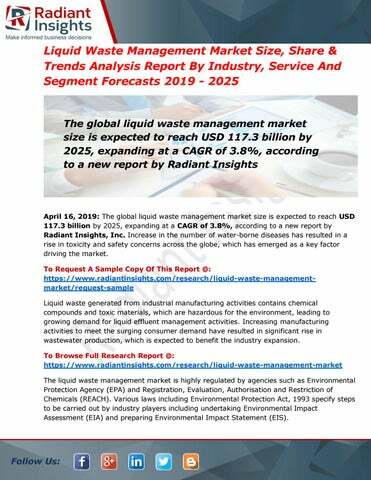 April 16, 2019: The global liquid waste management market size is expected to reach USD 117.3 billion by 2025, expanding at a CAGR of 3.8%, according to a new report by Radiant Insights, Inc. Increase in the number of water-borne diseases has resulted in a rise in toxicity and safety concerns across the globe, which has emerged as a key factor driving the market. To Request A Sample Copy Of This Report @: https://www.radiantinsights.com/research/liquid-waste-managementmarket/request-sample Liquid waste generated from industrial manufacturing activities contains chemical compounds and toxic materials, which are hazardous for the environment, leading to growing demand for liquid effluent management activities. Increasing manufacturing activities to meet the surging consumer demand have resulted in significant rise in wastewater production, which is expected to benefit the industry expansion. To Browse Full Research Report @: https://www.radiantinsights.com/research/liquid-waste-management-market The liquid waste management market is highly regulated by agencies such as Environmental Protection Agency (EPA) and Registration, Evaluation, Authorisation and Restriction of Chemicals (REACH). 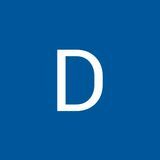 Various laws including Environmental Protection Act, 1993 specify steps to be carried out by industry players including undertaking Environmental Impact Assessment (EIA) and preparing Environmental Impact Statement (EIS).